Horoscope is the mirror of our life. It reflects our life; its twelve houses represent all the aspects of our life from our birth to death, from our education to our career, from romance to children, from debt to profit. I have discussed the 1st house & 2nd house of horoscope through my articles earlier and now I am going to discuss the third house of the horoscope / Kundali through the present article. 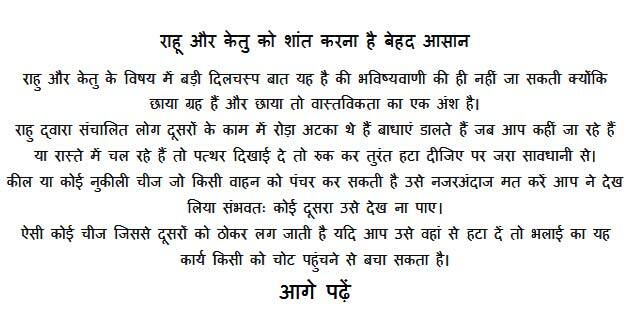 3rd House of horoscope gives success & failures. This is the basic thing but now I am going to explain what else you can read in third house of your horoscope. The third house of the Horoscope is known as the house of Courage, Valor, Bravery, Younger Sibling, left ear etc. We consider the left ear from the third house and study of the third tells us about the problems related to ears. This house tells us how courageous you are, how many friends you have, how many brothers & sisters you have. It also tells us about your closeness with your younger brother & sister. All the above things we consider from the study of the third house of the horoscope. If any person is jobless, unable to settle his business and keep wandering in search of job but fail to get any success then we consider the third house of Kundali. There is no doubt that we will definitely get the cause of this problem and also solution both from the study of the third house of the horoscope. 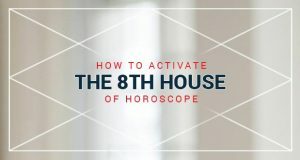 Suppose in any case we don’t get any clues from the third house then we will move to the ninth house because the ninth house is situated in front of the third house. Then we will consider both third & ninth house to find out any solution for this problem. The third house becomes strong if favorable planets like Mars, Mercury, Sun, Jupiter, Rahu situated in this house. Possession of these planets in the third house makes the native courageous, brave more than others. He influences the people strongly, always remains victorious. His opponents’ remains under his control and will never be able to defeat him. Chandragupta Maurya is the best example of this kind of person. The horoscope of Chandragupta Maurya is not available still you can understand the potential of this great king due to third house of the horoscope. The planets situated in the third house influence our life. The third house is the responsible for our patients, courage, power. If anyone easily involves in the quarrel with other for the petty reasons then we may come to know from the third house. The Mars of the third house makes the native so courageous that his enemies dare not to come forward and they will prefer to stay away from after seeing so many friends of you. Indira Gandhi & Narendra Modi is the best example for this. If you check the horoscope of great leader Indira Gandhi you will have best practice about the third house of horoscope & if you check the horoscope of our PM Narendra Modi you will definitely find the third house has a significant value in our life. Now learn all the nine planets & their effect in the third house. The third house is known as the house of bravery, heroism so there is no doubt that the presence of Sun in this house makes the Native powerful, influential in the house as well in the society also. It is said that third house is of the house of Mercury and Mars is its symbolic planet consequently Sun being the friend of both the planet gives the native powerful friends and these friends always stand with the Native, help the native in the hour of need. You are very fortunate if you are having Sun in the 3rd house of your horoscope. The presence of Moon in this house is of not so much significant. But one thing is certain that if Moon is in the Aries, Taurus, Cancer, Virgo, Libra, Sagittarius, Pisces zodiac sign then the Native will have more sisters than brothers. The moon will bestow its good results, will be beneficial in the third house provided it should be strong and Moon is considered strong only when it sits in the Aries, Taurus, Gemini, Cancer, Leo, Virgo, Libra, Sagittarius, Pisces zodiac sign. Moon is exalted in Taurus but it does not give good results if it conjoins with Rahu or Ketu even in its exalted position. Moon becomes weak when it comes under the influence of Rahu, Ketu, Mars, and Saturn. Moon is considered debilitated in Scorpio, Capricorn & Aquarius zodiac sign. Moon becomes strong in the company of Jupiter, Mercury, Venus. It gives good & auspicious results in the company of Mars provided it sits in the Aries, Leo, Sagittarius & Pisces signs. In this way, the auspicious results of Moon in the third house of the horoscope depends upon some factors i.e. it sits in the company of which planet, the moon is under the influence of which planet? Besides these the degree of the moon & Nakshatra is also important. Mars is considered very helpful in the 3rd house of the horoscope. As this house is of courage and Mars is the planet of energy & action so you can well understand how the Mars will help the Native if He is having Mars in his horoscope. The Native will be a man of action & energetic. Mars gives the courage, never give up in the life and he will be lucky enough that he will get the help of brothers & friends in the hour of need. The presence of Mars in the third house is very auspicious but its auspiciousness depends upon that it sits in which zodiac sign. If it is favorable you will become a successful player and get name & fame. The Mars of the third house will turn you into a hero of a specific field. You will defeat your opponents easily in the field in which you will work whether it may be sports competition or any other field. It is very important to have the Mars in the third house if you are in the field of sports. Mars becomes auspicious, beneficial if it is in the Aries, Leo, Scorpio, Sagittarius, Capricorn and Pisces. On the contrary the Mars of Taurus, Gemini, Cancer, Virgo, Libra and Aquarius is considered Malefic and inauspicious. No doubt this inauspicious Mars will reduce your courage, strength and positive energy and you will face the pain of separation & oppose from your brothers. Your relative will become your enemy. If your Mars is strong then it gives you power, the courage to defeat your enemy & opponent. You will see the face of defeat only when Mars is very weak otherwise you will always struggle and never give up. The presence of Mercury is very good but don’t forget this mercury should be of Gemini or Virgo zodiac sign. In case Mercury is of Gemini zodiac sign then it will be very good & beneficial for the native. The Native will have plenty of friends, always ready to help him. Without asking they will help you in achieving your goal. In short, you will be very lucky as far as friends are concerned. But one important thing to note is that if there is Pisces sign in the third house of the horoscope then you are going to get completely opposite results. You will have a vast friend circle if you have Mercury in the third house of your horoscope and much of your work get done by your friends, well wishers. When Mercury is auspicious & beneficial You will have a big fan following list that’s why you will never come in the circumstances to fight with anyone because much of your enemy will transform into friends. When Mercury becomes inauspicious your brothers & sisters separate from you, your relatives & friends cheat you and your close relatives support your opponent against you. You fail in the competitions in spite of your good performance. Apart from these things weak Mercury creates many other side effects. Mercury is considered inauspicious in Aries, Scorpio and Pisces while it considered auspicious in the remaining zodiac sign. Jupiter in the third house of the horoscope gives good results in certain zodiac sign. Cancer zodiac sign is the favourite sign of the Jupiter, if Jupiter is in the third house in the Cancer sign then it will give best results, in Leo sign will give good results and in Virgo & Libra sign results will be average. In case you are having Jupiter & Scorpio sign in the third house of the horoscope and Ketu (Dragon’s Tail) is also in the third house, consider yourself very lucky, this Jupiter is more beneficial than the Jupiter of Sagittarius zodiac sign. The presence of Capricorn sign in the third house don’t give good results when Jupiter is there, the Native will be betrayed by his friends, will not get the support of relatives and face the pain of separation from his brothers & sisters. The Jupiter of Aquarius is considered excellent I think you would have heard the world famous Kumbh Mela, it is held in Haridwar when Jupiter comes in the Aquarius sign. In Pisces sign Jupiter gives favorable results in the 3rd house of the horoscope. Jupiter is considered neither good nor bad in the third house of the horoscope. Jupiter’s results purely depend upon the zodiac sign in the third house. The auspicious Jupiter in the third house gets the love marriage. Firstly, you make friendship, then friendship turns into the love relationship and afterwards you get marriage without any obstacles. The Jupiter in the third house makes you travel more & more especially religious pilgrimages. If Jupiter in the third house is favourable, it will bestow you a friend who will lead a big role in making your life. This Jupiter gives you beautiful, educated and talented life partner and makes your luck & financial position strong. It also gets you success in the field of legal practice, education, finance. The Native will be unintelligent if Venus is of Aries sign in the third house of the horoscope. In fact, the presence of Venus is not good in the third house because it makes the native Timid. Venus will be beneficial in case of the female native but on the contrary, Venus will give a lot of female friends to male native. The native enjoy all the worldly pleasures, luxury, happiness, lot of servants if there is Taurus, Libra, Pisces zodiac sign & Venus is in the third house. He will have a lot of friends, brothers & sisters always ready to help him. Saturn’s result in the third house of the horoscope varies as per the different zodiac sign. In the Aries zodiac sign, Saturn is not considered good, makes the native coward & unintelligent. Saturn is considered favorable if Taurus, Gemini signs are in the third house. Saturn in the Cancer sign no doubt will shine your luck but this Saturn will also reduce the number of your friends. In the same way, in Leo sign, this Saturn will provide you with the good education, will make you fortunate but on the contrary, you would lose the support from friends, brothers & sisters. You will also become the miser. In the Virgo sign in the third house, Saturn gives average results. Saturn becomes most favorable and gives the best results in Libra sign in third house. The native becomes the well known personality and many people work under him. If you are having this kind of Saturn then considers yourself extraordinary. This Saturn makes the native king of the empire, no one able to defeat him and he receives all kind of happiness. The Saturn in Scorpio sign in the third house don’t give any good results but no doubt it helps in achieving the good education and even makes good technician or engineer. Even I have seen this kind of people in Computer software field. In Sagittarius sign in the third house, Saturn is considered good for luck. The Saturn is lord of Capricorn & Aquarius sign so no doubt Saturn gives good results when sits in the third house in these sign. It bestow you the support of your friends. In the Pisces sign the results of the Saturn are average. Rahu in the third house makes the native very diplomatic, he takes every step with strategies. He attack on the enemies & defeat them. Rahu makes the Native courageous, attack secretly and gets the victory. Rahu gives all the above results in all zodiac sign except Sagittarius. The Ketu in the third house gives lot of friends and they help you. You may have ties to the underworld. The Ketu makes the native very famous, extraordinary and a person different from the crowd. 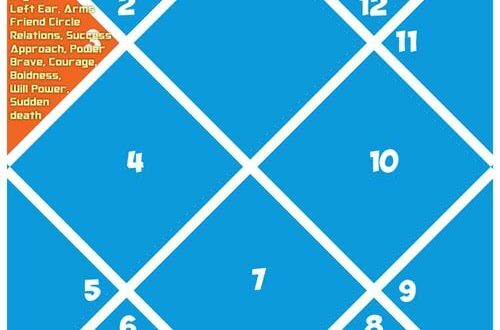 Ketu is very favorable in the third house but there are pros & cons. The cons are that you may become drug addiction. All other planets I will cover in this section please stay with me. All the above things discussed above makes the third house of the horoscope so much important.